Open Area 31 (Figure 48) is that part of the Northern Zone bounded by ditch 25019 to the west, 25016 and 25039 to the south, and Road 1 to the east. It is presumed that it extends northward to the watercourse that runs below the upper gravel terrace step. While the other enclosures west of Road 1 extend north-south, OA31 extends east-west, perhaps occupying more marginal land alongside the watercourse. Only part of the enclosure interior is exposed and investigated within the northern parts of Excavation Areas D, E and F. Various gullies or minor ditches of Late Iron Age date occur within OA31 and may represent subdivisions of its interior, while pits are notably more prolific than in the enclosures to its south. A series of lesser ditches are located in the central western part of the OA31 interior and may be construed to define a rectilinear pattern of small sub-enclosures. Curiously, these appear to be more orthogonal with the Period 2A enclosure landscape than with that of Period 2B, retaining the same basic axis as the earlier system of ditches 25024/25036 (Period 2A) - a roughly north-south alignment, predicated on the line of the water channel that runs east to west, some 40-50m to the north. However, their artefactual content suggests that these ditches continue to accumulate material until the mid-1st century AD, which implies that they lie within Open Area 31. Their south ends appear to align with the point at which 25019 (the western boundary of Open Area 31) starts to turn west. Although extensively truncated, it is likely that these ditches define a regular layout of minor plot divisions, which perhaps extend northward up to the edge of the watercourse. Most of the ditches (Group 154) vary widely in length between 4.40-9.00m and in width between 0.40-1.20m, but all are basically short and broad with shallow depths and flat bases. They divide into north-south and east-west aligned groups. Those aligned north-south, 25004 (seg. 9168), 25001 (seg. 9085) and 25014 (seg. 9870) are located roughly 9m apart. Similarly, east-west ditches 25005 (seg. 9175), and 25232 (seg. 9095) are 5.5-6m apart. Gully 25005 contains a minor re-cut or structural slot (seg. 9173). Feature 25108 (seg. 8121) (Group 155) is a 3.6m length of small ditch, which extends beyond the northern limit of Excavation Area E. At 0.55m wide and 0.25m deep, it has a NNW-SSE alignment and a rounded terminal at its south end. The presence of Dressel 1 amphora sherds and samian, supported by quantities of predominantly grog-tempered ware, provides a late 1st century BC to mid-1st century AD date range for deposition within them. It is possible there may be some chronological distinctions among the gullies, but it seems more probable that all were in use and passed out of use together. Gullies 25109 (seg. 8136) and 25213 (segs 8085, 8103, 8185) are inter-cutting, curving ditches, located in the south-east corner of OA31, which can only be partially traced. The earlier, 25109, is a 4m-long ditch fragment. Gully 25213 is 1.0-1.4m wide and 0.4m deep, its 9m length displaying an irregular curve. These remain uninterpreted. No finds were present in the earlier feature, but 25213 contains a small amount of Romanising greyware along with grog-tempered pottery, perhaps indicating that this feature is open as late as the mid-1st century AD. As such, it is likely that it is contemporary with the Period 2B use of the enclosure. 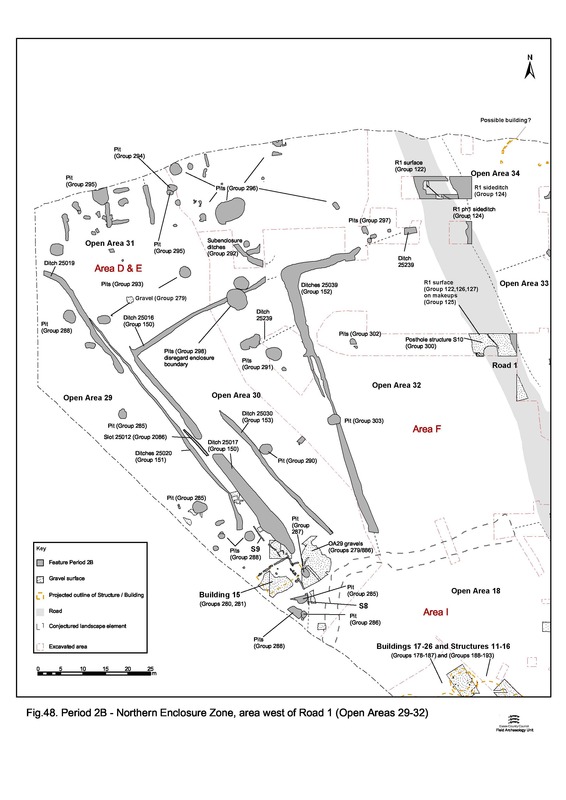 Pitting within OA31 is grouped and discussed partly by excavation area (from west to east across the enclosure). Within Excavation Area D, pits 9084, 9111, 9115, 9142, 9144, 9151, 9260, 9971 (Group 293) and 9036 (Group 294) lie in OA31. These pits (Period 2 General) are relatively large and circular, generally being 2m-3m across. Pits 9037 and 9195 (Group 295) seem to be clearer Period 2B examples, though the latter's relationship with sub-enclosure ditch 25014 is unclear. Artefact assemblages are dominated by grog-tempered pottery, and baked clay and metalwork are generally rare though pit 9084 (Group 293) contained loomweight fragments. The occasional presence of small quantities of Roman brick and tile may emphasise the transitional nature of some of these pits. 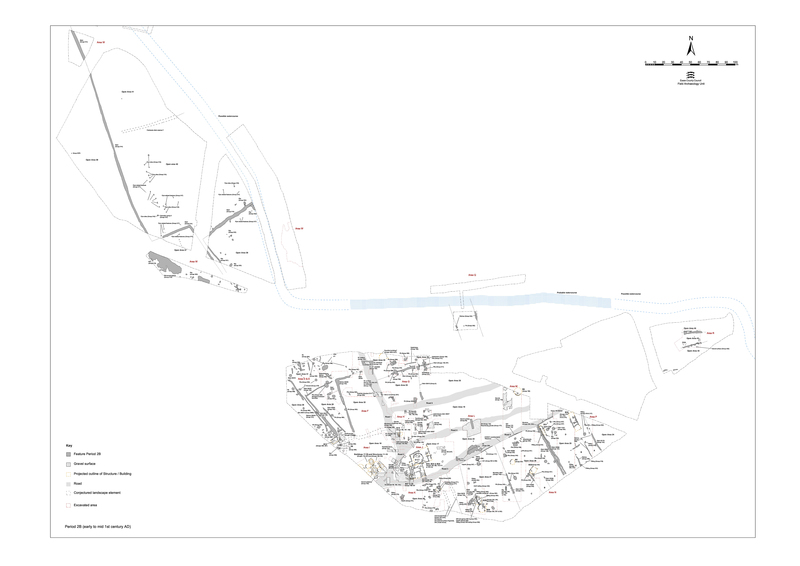 Within Excavation Area E, pits 8012, 8017, 8019, 8026, 8041, 8054, 8062, 8112, 8164, 8257 and 10014 (Group 296) lie in OA31. The pits fall into two categories based on size and shape; large and rounded pits over 2m diameter (e.g. 8012, 8026, 8257, 8274 and 8282) and small and rounded pits under 1.5m diameter (e.g. 8019, 8164). However, such subdivisions have no obvious spatial correlation. These pits contained a range of fabrics and forms dating to the second quarter of the 1st century AD. Also present in most contexts are Roman sherds in small quantities. Predictably, the larger pits tend to have more complex fill sequences and larger finds assemblages. Their finds mainly comprise pottery and animal bone, but also daub and briquetage. Sieving recovered very small amounts of burnt animal bone from most pits. It is likely this combination of large feature size and finds assemblages indicates that the larger pits were used for rubbish disposal. Pit 8012 is an anomaly among these larger pits. Roughly circular, at 2.2m diameter and depth in excess of 0.85m, it contains three pottery-rich fills as well as a copper-alloy brooch fragment (SF1349). While this appears to be a rubbish pit, it is subsequently cut by smaller oval pit, 8017, at its centre. Pit 8017 has a single pottery-rich fill and seemed to be a smaller deliberate re-cut of the original feature. The smaller pits may have had a different function, at least before being backfilled, but no clear evidence for any specific purpose can be attested. On the whole they lack the quantity and range of finds, though 8019 is an exception with its large amount of pottery, briquetage, bone and, perhaps significantly, 40g of tile spall fragments. Pit 10014 is small and roughly rectangular (1.65m x 1.0m). It contains relatively large amounts of pottery compared to its shallow depths, together with a substantial quantity of daub. All these pits contain early to mid-1st century AD finds and some may have continued to receive material into the post-conquest period. 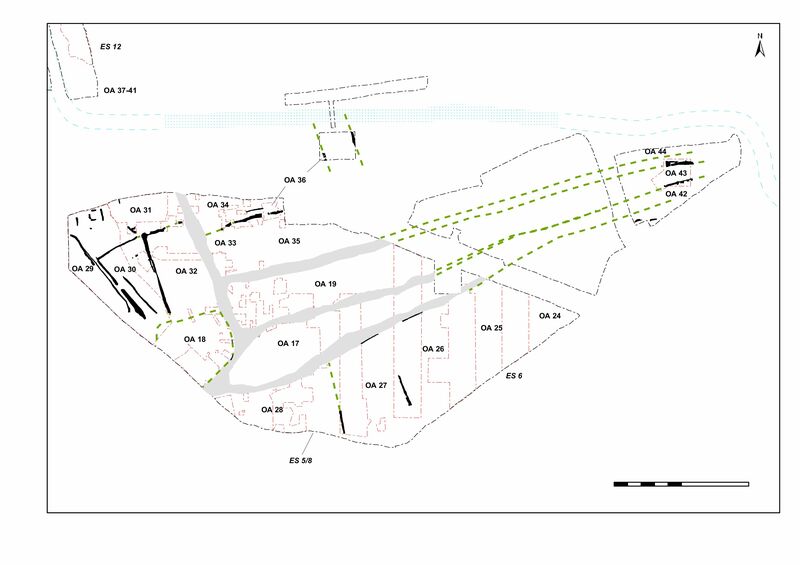 Within Excavation Area F, pits 10111, 10123, 10146, 10197, 10383, 10695 and 10552 (Group 297) lie within Open Area 31. It is evident that there is a thread of continuity between many of the Period 2A and 2B pits in this part of the enclosure, with the later features apparently being deliberately located above the earlier, suggesting zones of pitting remained fairly constant despite the remodelling of so much of the site layout. Apart from small circular pit 10111, all are rectangular in plan. They range in length from 1.1 to 2.6m, though generally 0.8-0.9m wide, and display two alignments, either roughly NW-SE or ENE-WSW. Few are deeper than 0.33m, most within the range 0.15m to 0.22m, and they tend towards the slot-like; although not obviously structural in their arrangement. Consequently, it is uncertain whether these features are simple pits or have a specialised function. Similar examples occur further west (e.g. 10014) and, collectively, may be construed to describe a curving alignment across OA31. In addition, the rectangular cuts seem to be located in relation to the end of enclosure ditch 25039 (Group 152), and what was recorded in the field as a finger-like protrusion from its end is likely to be another such undistinguished rectangular feature. Although distinct in terms of shape, all these Area F pits contain fairly typical Late Iron Age assemblages, comprising grog-tempered pottery, daub and loomweight fragments. In overview, there seems to be a higher density of pitting within OA31 than in those Northern Zone enclosures to its south (OAs 29, 30 and 32). Whether or not this is a real zone of pitting along this northern edge of the settlement is debatable. During excavation, pits were relatively easily seen in this location because of the lack of later stratification and overlying deposits in this area, and because they were generally cut into clean orange brickearth. The true nature of pitting to the south may simply have been obscured by later settlement activity and unexcavated overlying deposits.